This entry was posted on Thursday, June 4th, 2015 at 1:59 pm. For those of you who don’t know, I have celiac disease, which means I’ve had to kiss the lovely gluten goodbye. Actually, this hasn’t been too hard for me because I’m one of those ‘eat to live,’ not ‘live to eat’ sort of people. I will admit, however, that my life BC (Before Celiac) was so easy – I never had to think about what I put in my mouth. Now I’m a tyrant – wheat, rye, and barley – get out of my house! With that said, I’m always on the lookout for great (and by great, I mean, very easy to make) gluten-free recipes. I haven’t tried this one yet, but it looks delicious. 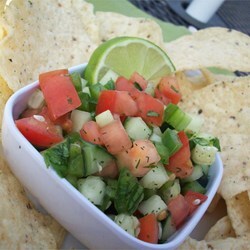 I love cucumbers and tomatoes, and everything is about to get as fresh as can be now that sweet summer is here. In a small bowl, combine the first six ingredients. In another bowl, combine the sour cream, lemon juice, lime juice, cumin, and seasoned salt. Pour over cucumber mixture and toss gently to coat. Serve immediately with chips.